Pioneers in the industry, we offer goliath gantry crane, industrial goliath gantry crane, goliath crane and semi goliath crane from India. 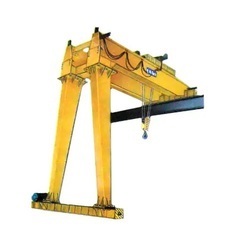 We feel pleasure to introduce ourselves as the foremost manufacturer and exporter of Goliath Gantry Crane. It is manufactured using the premium grade components by our deft professionals. This crane is used for lifting and handling the materials in construction places, warehouses and vehicles maintenance firms. Furthermore, this Goliath Crane is thoroughly examined against variegated parameters by our quality inspectors before delivering to the esteemed patronâ€™s end. 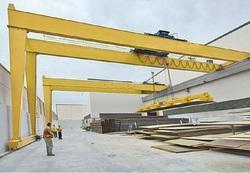 With objective to cater to the rising market demands we are providing Industrial Goliath Gantry Crane to our clients. We are presenting Industrial Goliath Gantry Crane in range of technical specifications and it delivers topnotch performance for long time period. It is best suited for industrial applications and is manufactured with best grade material and latest technology. Furthermore, we carry out stringent quality tests on the complete assortment to ensure delivery of best product from our end. Besides, we are providing this at reasonable price.